Bocas del Toro is located on the Caribbean coast in northwestern Panama. The interior of the vast region is difficult to access, so most travel activities are located near and in the ocean. This includes great beaches, diving, snorkeling, and other outdoor activities. The region is a cultural mélange comprising indigenous Ngöbe and Buglé people, descendants of 19th century Jamaican immigrants, Hispanics from other parts of Panama, and descendants of West Africans caught in the slave trade. As a result, English is widely understood in the region as a lingua franca. Selina Red Frog is part of the Isla Bastimentos Natural Park. The hostel has an outdoor pool and sun terrace, and guests can enjoy a drink at the bar. The property also features a video room and common area with a ping-pong and pool tables. Average score from 82 guest reviews: 7.7/10. This hostel was beautiful. It's got a super relaxing vibe about it and the facilities are top notch. The great thing about red frog is that you can walk straight to the beach in less than 10 minutes and there are multiple other beautiful beaches within walking distance as well. It also has a pool which is great if you don't feel like getting all sandy. The rooms are pretty nice, a little crammed but the beds are comfy and the AC is on at night. The communal kitchen is big and clean so a good spot to cook. There also some really great areas to chill both inside and outside if you need a reprieve from the heat! The hostel offers free activities daily on the island and are also super helpful with booking tours. Pick up food etc before you boat over because there is only a small store to get necessities from once you are there. Top location, you can relax there. Good food, and happy hour. Fresh towels every day. The vibe at this place is super laid back, but classy for a hostel. The mattress was the most comfortable one of my whole trip. Good price, clean, friendly staff, great pool, good music. Staff were really really friendly and welcoming. Decoration was superb. Brings to do all the time. Location excellent. Has everything you would want from a back packers hostel and more. Nice Place for relaxing. Make sure you go grocery shopping before you go to the island. If you are taller than 1.90 m you might wanna book a standard private room, because the private w/ shared bathroom is tiny and the bed is surrounded by three walls. Just a 4 minute walk down a path - where we saw red frogs everyday - to the beach. Great social/bar area and lots of seating/loungers/shade around the pool. They put on free activities most days which are great. Building works in progress weren't a problem and didn't wake us at all. Baby sloths in the tree at breakfast!! Really helpful staff and comfy beds. Big point for breakfast, no pancakes;-) Clean facilities. Surrounded by a mature garden, the beachfront and eco Turtle Beach House offers a boutique-style accommodation. It is about 20 minutes away from the busy Bocas town. Free WiFi and parking are both available. Average score from 44 guest reviews: 9.4/10. 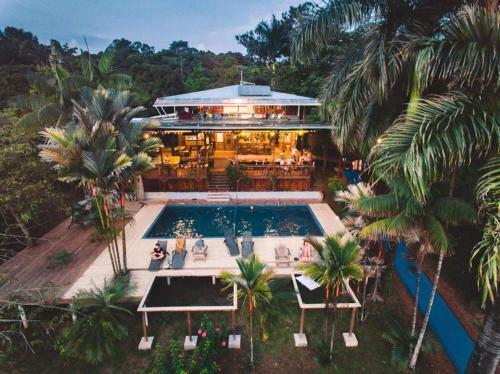 This B & B is a gem between sea and tropical forest. It is the perfect way to enjoy the wild sounds of the forest within a very safe environment. Early in the morning, while waiting for breakfast, I took advantage of the beautiful veranda overlooking the garden to watch the noisy and colourful birds. Breakfast was at 8.30am and Sandra and David, as the perfect hosts they are, always managed to create a relaxed and fun atmosphere. The beach is beautiful and the water warm. This beach is particularly known to surfers and therefore not always ideal for swimming. We had dinner in the restaurant next door and the food was lovely. Sandra and Dave are perfect hosts and very helpful in every regard! We enjoyed our stay very much! Dave and Sandra were perfect hosts, very helpful and accommodating. The rooms were very spacious and spoiling, the mattress supplied me the only continuous and full sleep in my whole trip (a month), and the breakfast - prepare for the best french-toast ever. :) The location is ideal - beautiful and relaxing beaches, away from the noise and mess of the city center (unless you want parties). Perfect location on the beach. Sounds of waves all night. Great owners. Loved our stay. The Turtle Beach House is such a beautiful & special B&B! The owners, Sandra & Dave, are so welcoming, helpful, and go beyond to make your stay special. Felt like we were leaving close friends at departure. The area & beach is spectacular. Although it's not a swimmable beach, it was so beautiful; we walked the beach every morning/afternoon and had the entire beach to ourselves. Beautiful house in a lovely garden setting with views of the Ocean and the rainforest behind. There are just four rooms and a super balcony and kitchen and lounge area. Breakfast is served on the balcony with Sandra and David who are wonderful hosts. All freshly made each morning by Grizelda, a local lady, and Sandra. The beach in front of the house is stunning and goes on for miles, the waves here are strong but you can walk along the sandy forest trails to a deserted swimming beach which is lovely. There are two very good restaurants either side of the house for lunch or evening meals. This is the perfect place to stay on Bluff Beach if you like peaceful surroundings and nature. Everything was perfect. Our room was bright and airy with a nice breeze. Dave and Sandra were extremely helpful with getting us taxis and helping us plan our stay. Plus they're a lot of fun. The beach is beautiful. There are secluded spots and surfer beaches. A perfect place to relax. Located in Bocas del Toro, Jardines Vista del Mar Condos offers an outdoor pool. This self-catering accommodation features free Wi-Fi and Istmito Beach is 70 metres away. Apartments will provide you with a TV, air conditioning and cable channels. Average score from 205 guest reviews: 7.9/10. Perfect place for a little holiday romance! Really liked it. Thoroughly enjoyable stay at Muhammad's place. He is a very hospitable gentleman, who'll provide you with all sorts of useful information about what to do in Bocas. The condos are modern, comfortable, and the location is perfect, away from the noise of the centre of Isla Colon, but just a short taxi ride away from all the action. You won't be using the beach across the road, but you'll want to spend the day on various other beaches anyhow. Muhammad will also help you book transport, and taxis seemed to be easy to find during the day at the gas station next door. The wifi worked well (not a given in this part of the world! ), and the a/c worked and was practically silent. Highly recommend this place. Enjoy your stay in Bocas! Close to beach, easy walk to centre, pool available for use. Corner store near by. Great place away from the downtown area but easy to get to. Owner/manager very helpful and will arrange transportation to different areas etc. Various places to eat within walking distance or short taxi ride. Nice condo with all that you need (kitchen with supplies, tv, wifi). The bedroom had a safe to keep valuables in. There is a pool on the property and a little store down the street which is very convenient. Muhammed was very knowledgeable and offered some great recommendations of places to eat and things to do. The view was beautiful and the condo is very nice. The location is near the only gas station on Bocas del Toro, which is a good landmark to give taxi drivers. Grocery store 3 doors away is a big advantage of this condo. The owner is very helpful and courteous. The owner was incredibly helpful and made you feel very welcome. Nothing was too much trouble. Helped in organising trips out etc. The accommodation was very spacious and clean. Large television with comfortable sofa and chairs. Separate dining area, well organised kitchen, two good size bedrooms with ample wardrobe/cupboard space. They even provide separate towels for you to take and use at the beach or pool. We went to the beach for the day and would not return before our check out time, however he allowed us to keep our bags in his office, when we return he let all three of us have a shower in the office with clean towels and toiletries before we had to start our journey home ( so much nicer traveling a furner 6hours with fresh clean bodies, not salty and damp) finished off with a glass of wine. Altogether a beautiful and stress free stay in Bocas, accommodation I would highly recommend! The bed was comfortable, slept great. The owner was very helpful. Beach across the street. Enjoyed the location out of downtown . Decent walk into town. Always a taxi next door @ only gas station on island. Tropical Suites Hotel is an oceanfront boutique property located in the heart of Bocas del Toro, Panama. Rested on the shoreline, the hotel is a short walk to over the water restaurants, shops and attractions. Average score from 756 guest reviews: 9.1/10. They included a breakfast that you could choose from three different restaurants. The hotel looked like a Southern Sorority House. When we were pulling up in our water taxi we were so pleased to see that we had picked this hotel. Great location to all the restaurants. Staff was very helpful in calling water taxi's, and any needs (like ice). We loved staying here. Great room, very clean, and always kind helpful staff. Clean facilities, free coffee downstairs (and coffee maker in room). Great location, central to everything. Great service! Large, clean room in a great hotel in an outstanding location! A very clean hotel in a great location. They stored our luggage for us for the day. The front desk staff were extremely helpful with restaurant suggestions and called the places for us. Good mattress and sheets, very important and so many times neglected. Fabulous location right in town and on the water. Big, clean room,great location and very friendly staff, especially Macarena, the girl at the front desk. Excellent hotel room with a small kitchenette, well situated, quiet and very comfortable bed. The rooms are large and very comfortable. There is even a small kitchen if you wish to cook your own food. The staff are knowledgeable and very willing to help. The hotel is centrally located in town so shops, restaurants and water taxis are all very close(less than 2 minutes walk). Wonderful modern hotel in a great location. We had a big room which faced out onto the water, it was a beautiful view. Staff were lovely and we were able to book a boat trip through reception which was great value and so easy to organise. I would highly recommend. 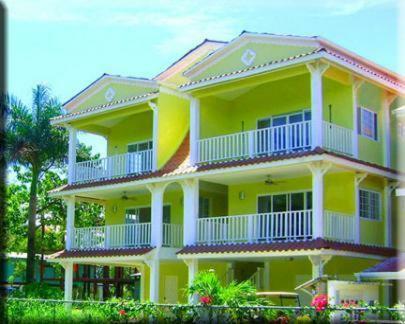 Offering a garden, Sun Havens Apartments & Suites is located in Bocas Town. Buena Vista is 22 km from the property. Free WiFi is available throughout the property. The pet-friendly accommodation is air conditioned and has a satellite flat-screen TV. Average score from 310 guest reviews: 9.1/10. everything, the owners are really really nice and helpfull, we gave a nickname to one of them "papa ours" lol . The hotel is really cute with a lot of flowers and plants and in a good location, easy to find, in a quiet area near the center. The room was clean, the bed really good . The accommodation was very comfortable and the room even had a kitchen with cupboards, stove and fridge for those who like to prepare their own meals. The owner and his staff were very helpful providing information on Bocas del Toro and surroundings. The owner very kindly drove me to the pier when I was leaving the island. As it was raining heavily and I wasn't certain about the departure point it was fortunate that he guided me to the right spot. Although Sun Havens isn't in the centre of town it's about a 10 or 15 minute walk away so very convenient without the noise of the downtown bars and clubs. The managers were really lovely and helpful, and made some good recommendations. The room is huge, with plenty of space to spread out. There is a nice little balcony (but the pigeons were a nuisance). The kitchen is very useful and we could cook easily there. The location is at the end of town, but extremely walkable. We enjoyed our stay here. The staff behind Sun Havens, Tomaso and Maurice, are in the office at all times to make you stay better. I have stayed in Bocas 3 times and at multiple hotels Airbnbs. Sun Havens is the best for the money, and it's in the best location in Bocas Town, imo. Unless you need to be directly on the water, this place is the best deal in town. management of porptey, with laundy service, got to know good friends!! First class service!! Room was very cute with nice small kitchen (we were in the loft room). Manager was a great guy and extremely helpful. 3 or 4 blocks to everything, a couple markets close by and many restaurants within walking distance. 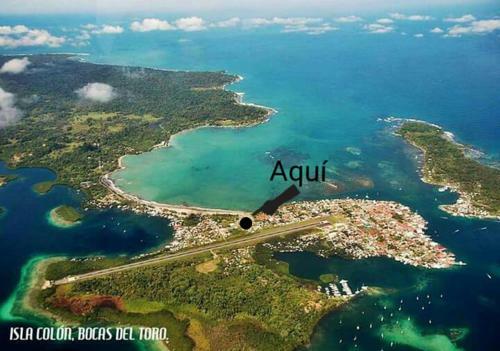 See all hotels in Bocas del Toro. BOOK THIS HOTEL NOWSee all hotels in Bocas del Toro. Surfari Bocas B&B offers pet-friendly accommodation in Bocas Town. The bed and breakfast has a terrace and views of the garden, and guests can enjoy a drink at the bar. The rooms are equipped with a private bathroom fitted with a shower. Average score from 222 guest reviews: 9.0/10. At first we just booked 3 nights at Surfari, and than we stayed for 1 month. Thank you Jim and Charline for this nice stay at your place and that you are so lovely to all of your guests. It was a pleasure to meet you. And also thank you PASCAL for showing us Bocas and for the badass time we spent together. We always felt welcome at this place. You just have a half minute to the supermarket and one to the main Street of bocas. If you want a good time and a beautiful stay, you have to go to SURFARI. Loved it! Breakfast great, clean and friendly staff. + -Let us check-in earlier for free; -Perfect breakfast (you have 3 options to choose of); -You can get easily from the airport to the hotel on foot; -Perfect room; -Friendly and helpful stuff; -Fast Internet; -Everything is super-close from the hotel; -There is a kitchen to cook Recimmend this place a lot!!! There are friendly workers, friendly guests and lovely animals (one dog and 2 cats). We had a lot of fun discussion all the time :D Great breakfast include, great A/C, hot shower, convenience location, nice terrace, equipped kitchen. Lovely atmosphere! Jim and Charlene, the managers are extremely helpful and friendly at all time. Breakfast was awesome too and the rooms are clean and big enough for a couple. Super friendly staff, Sarah(Manager I believe) let me check in early and even hooked me up with some fresh coffee.Room was super clean.AC was ice cold. Featuring free WIFI and a huge sun terrace with direct access to the ocean, Hostel Mamallena Bocas offers accommodation in Bocas Town just few minutes walk from the center. Guests can enjoy the on-site bar. Average score from 102 guest reviews: 8.9/10. This place is very well taken care of and very clean. The sheets were comfy and clean. The bathrooms were clean and it is the perfect mix of fun and relaxation. The setting, open space, bar and staff were all excellent. Carson on the front desk and Raul behind the bar were fab! Location a little bit out of the party area. More quiet. Also the sea is clearer on that side and a swim from the dock is ideal. Happy hour from 4 to 8. A really cool place where they go the extra mile for you to have a great time. A pool table, some evening events (a concert) and a good kitchen. Also the location is just perfect, right by the water with a terrace to chill out on. Right on the water and the common area was open for a 270 degree view of the water. The happy hour at the bar was great and there were lots of people which gave it a great vibe. Hostal Doña Irma Bocas is located in Bocas Town, 22 km from Buena Vista and 8 km from Isla Colón. The rooms come with a shared bathroom. Hostal Doña Irma Bocas features free WiFi throughout the property. Guests can enjoy the communal balcony. Average score from 55 guest reviews: 8.8/10. The family was very friendly and helpful. Rooms and hostel overall was super clean and comfortable! I recommend this place 100%. A pretty little homestay-like place on the first floor with only six rooms, run by a friendly family living on ground level. Clean, comfortable and within walking distance from Isla Colon's main street, yet located on a comparably quiet street. Overall great value for money and highly recommendable! Very nice place to stay. Great value for the money. Very clean. It was simple but there was still some charm. The family was very nice. Always smiling and giving a quick wave. Not suitable for anyone looking for excitement. It was very quiet and calm. The location. It was a cozy room and very quiet. The owner and family are just fantastic! The owner is an extremely friendly and helpful woman. The airport is less than 5 minutes away by foot, although there are not many flights per day so the airport noise is not an issue. The property is close enough to the waterfront to stroll to. We were allowed to stay in the room until our flight on the last day as there was no one else checking into the room. Good location! It is in a house so we felt at home. Irma made sure the security was in place and we felt safe there. It was nice staying at a place like this and we recommend it to anyone! - Very clean and quiet place. - The breakfast 2 houses from Irma's, Panamian style at USD 2.50. 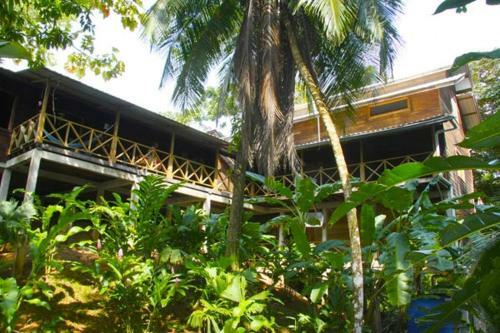 Bambuda Lodge is located in the tropical rain forest in Bocas del Toro. The property features a coral reef off its dock and a swimming pool with an on-site bar and music all day long. WiFi access is available for guests. Average score from 378 guest reviews: 8.7/10. Brilliant hostel, great staff and perfect location in paradise. The food is amazing. With 4 cooks in the kitchen it is no wonder. It is a great place to relax. Beautiful hostel with very spacious and clean dormitory rooms. Excellent on-site restaurant with a small menu of some very delicious meals. Although there is no beach in the direct vicinity you can snorkel in front of the hostel. Unless you do not want to hike through the jungle to get to the beach you can take one of the frequent and cheap watertaxis to the other side of the island/one of the nearby islands. I like everything from the location, the staff the food right down to the personal fan!!!! I liked everything about this place!!!! We've travelled to over 30 countries the last few years and this hostel is our new No.1 favourite. A really incredible place, almost retreat like! Rooms with a jungle view, the pool, the lounging areas, the slide to the sea and the fantastic food- we cannot recommend this place enough! The staff are great too (Diane in particular was so friendly and helpful) and they have really talented cooks! Stay here- its a mini paradise! Bambuda is for sure one of the best hotels my friends and I have stayed. Amazing environment, friendly staff and great food & drinks. For sure, we'll come back to that beautiful place! 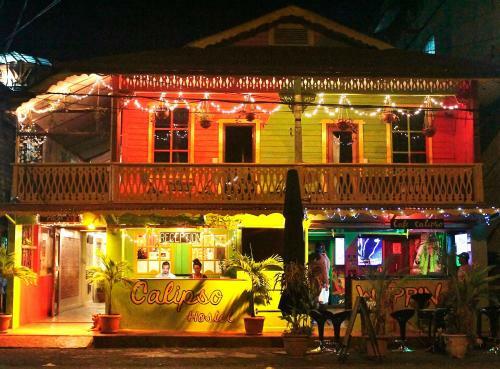 Hotel Cala Luna is located 350 metres from Simon Bolivar Park in Bocas del Toro Town Centre. It features a furnished terrace, table tennis and Wi-Fi in public areas for free. Average score from 65 guest reviews: 8.7/10. The owners were super nice and helped me even when I was sick for a few days. It is also a very safe space. Staff was great. Restaurant fantastic. Quiet and comfortable and very clean. Very knowledgeable front desk. The staff was very helpful and friendly. We felt like at home. In addition, the pizza they serve in the restaurant is maybe the best I ate outside of Europe. I would suggest this hotel anybody who has a high standard concerning cleanliess and wants to sleep 5min away from the party-town. Extremely clean room with a great bed and shower. The ocean breeze on the top floor made it so pleasant that only a fan was used at night with no need for AC. Alberto, his wife and their long-term staff do an excellent job in making you feel relaxed and comfortable. They make you feel like old friends and go out of their way to provide a pleasant experience. Of course, their food is awesome and they have the very best pizza in Panama! I was taking Spanish classes at HablaYa. Location was great, and also close enough to downtown. The room was nice size, comfortable and very clean.Nice outdoor table area-fun to see other people at times, andshare a glass of wine. The hotel owners have an Italian restaurant. We loved their meals. Our room was equipped with a fridge, good to keep some beverages. The distance to the city centre is perfect. It's still reachable by walk from Bocas Town City Centre (5-10 minutes) but in the night it is very quiet. Offering a sun terrace and views of the sea, Bocas Surf School & Hostel is located in Ground Creek. Guests can enjoy the on-site restaurant. Each room comes with a shared bathroom. Average score from 12 guest reviews: 8.5/10. 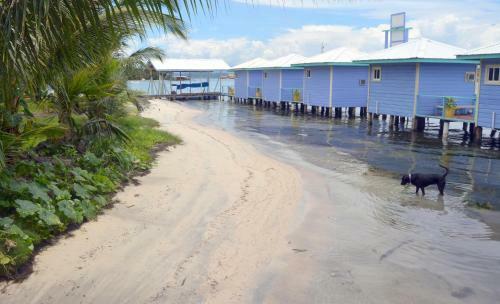 Zukhasana offers accommodation in Bocas Town. Free WiFi is offered throughout the property and free private parking is available on site. You will find a coffee machine in the room. You will find a shared kitchen at the property. Average score from 19 guest reviews: 8.3/10. Lucie was an excellent host. Our room had self adjustable A/C and a balcony. A small beach right around the conor. Supermarket next door. Fully stocked kitchen. Alltogether a Great stay. La atención de su dueña y el ambiente familiar, excelente lugar! Die Austattung ist sehr gut, Kühlschrank schön groß. Die Dusche ist nicht nur kalt. Man hat viel Platz für sein Gepäck. 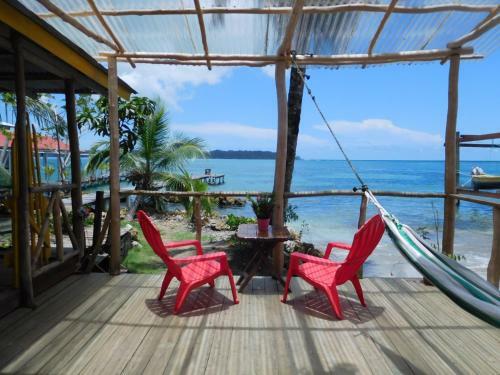 Located 1 block from the seafront in Bocas del Toro, Spanish by the Sea – Bocas offers a communal kitchen and dining area, a garden with hammocks and accommodation with free Wi-Fi. Average score from 91 guest reviews: 8.1/10. 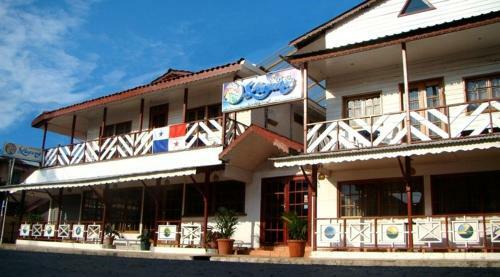 Good staffs, good vibes, large bathroons, net, couch, kitchen and very close to the bocas marine, shops, markets, everything! I really like this place! And the cats are so cute!! Wish I had found this sooner! Quiet, laid back, spacious,large kitchen,comfortable beds..finally got undisturbed sleep. Great common areas--patio garden & more. We showed up early and it was Carnaval time no where to stay so we showed up at the door 5 days early! Chris could see that we were stressed out. He told us to take it easy stay calm and not to make a bad decision. He told us to take it easy stay calm and not to make a bad decision he found accommodations for us for the next two nights although he was fully booked. It is an amazing place to stay ! Fernando was warm, welcoming and helpful. The beds were comfortable and rooms spacious with lots of Windows for a nice breeze. I felt at home instantly. Fernando let me borrow his bike when he didn't need it , it's a social environment the next time I visit bocas I would love to take classes!! Would recommend . Lovely environment. Nice people, both guests and staff. Fernando, who is the manager, couldn't be more friendly and helpful. Location is fantastic and facilities offer all you need. My stay at Spanish by the sea was awesome! I loved all the people there, it's right in the center of the town so you're close to everything and it's really clean. So no reason not to go there! Say hi to Luna for me! Great location, construction of building very impressive. Close to main road, ferry, taxi boat ect. Very friendly and helpful staff. Would recommended to everyone, hope to visit again. This is a really nice hostel with friendly and helpful staff. I really liked the communal spaces and very welcoming and friendly staff. There is a really nice open plan kitchen with everything you'll need. (including free coffee.) I had a great time staying here. The hostel is in a central location. The staff are really helpful in providing you with tips and advice on what to do around the islands and how to plan your onwards journey whether it's to Panama City or Costa Rica. This was my favourite place I stayed at during my short trip through panama and costa rica. 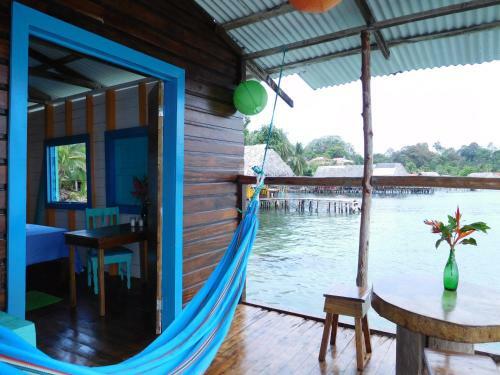 Featuring free WiFi throughout the property, Calipso Hostel Bocas del Toro offers accommodation in Bocas Town. The hostel has a terrace and views of the garden, and guests can enjoy a drink at the bar. Average score from 24 guest reviews: 8.0/10. The place is absolutely amazing. Everything is close by, and the people of the staff are so helpful and friendly. It felt like home. The bathrooms are really big and nice. The rooms are clean and with enough space to move and save your stuff. The lady who makes breakfasts in the morning is very friendly too. I definitely love this place! Would totally recommend! Fantastic location...right on the town plaza......so easy to access everything...transport , supermarkets, restaurants. Loved the first floor veranda outside my room for sitting/eating breakfast/people watching and chatting to people. Lady who made pancakes and cleaned up the kitchen every morning was lovely. AC kept dorm room at a pleasant temperature. Ich hatte eine super zeit, habe super leut kennen gelernt! Das hostel ist echt angenehm würde sofort wieder herkommen! O hostel é bem no centro, a localização é ótima. A internet funciona bem. A cozinha é bem equipada. As áreas de convivência são bem legais e o pessoal do hostel é super simpático! Desayuno muu rico! Wifi funcionaba todo el tiempo. Baño limpio. Gente amable. Lugar mas tranquilo pero muy bien ubicado. Las personas del hostel son muy amables y agradables. La cocina estaba miy limpia y muy boen provista de elementos para cocinar. La ubicacion es excelente. La ubicación es perfecta! Está ubicado en la avenida principal de Isla Colón, desde allí caminábamos a los restaurantes, taxis acuáticos y bares. Súper céntrico! El ambiente es cool, podíamos usar la cocina(que está bien equipada), las camas son bastante cómodas y limpiaban la habitación todos los días, que es un poco pequeña pero bastante acogedora. Offering an à la carte restaurant, bar and terrace, Hotel Posada Los Delfines is located 450 metres from Bocas del Toro main square. Free WiFi access is available in public areas and breakfast is included. Average score from 154 guest reviews: 8.0/10. The staff is incredibly friendly and helped us with both our travel arrangements and activities in Bocas. The rooms are impeccably clean and offer everything that is needed. It is situated in a quieter part of Bocas which makes it a good choice for those who need a break from partying yet it is close to all the bars and restaurants. We would definitely come back! Everything great for the price. Great terrace to sit outside room. Nice restaurant area. Helpful manager. The owner Carlos is so friendly and the entire staff was wonderful.. Very nice and comfy room, hot shower, good food and in a nice neighborhood. I will definitely go back there again when I return to Bocas. Very nice hotel for a really good price. I highly recommend it. Food is great also. Very clean and comfortable room. Staff was very nice and willing to help. Nice location, walking distance from the centre. The place was close to town yet just out to be quiet. The bed was so comfortable and the ac worked a treat. The rustic and ecological Tesoro Escondido Lodge Cabinas offers accommodation in Big Bluff Beach. Located in a secluded area of Colon, this property uses solar panels. Bocas Town is 5 km from the property. Average score from 75 guest reviews: 8.0/10. This place was exactly what I wanted. Such a great set up! The restaurant patio was amazing! I could sit there all day and watch the waves. The managers were so helpful with anything you needed, we really had no plans going there and they were full of great options. I loved that you could have all your meals there. They were all delicious, we had 4 breakfasts and 4 dinners and all were sooo good! There are great sitting areas/hammocks all around to relax and enjoy! I went with my mum and she loved it as well. We loved this place! The cliff-top location is stunning, the staff are super friendly and helpful and the food is amazing. The kitchen is well equipped, the bar is reasonably priced and it's 20 minutes or less walking to some of the best beaches and surf on the island. We woke each morning to the sound of howler monkeys in the jungle outside the window on one side and waves rolling into the cliffs on the other. Every day we stayed was great from there! We'll go back there in a heart beat if we're ever in Bocas again. Great location away from the town. Right next to solitary beaches surrounded by forest. Food for dinner was superb for a reasonable price. We really enjoyed our stay: very nice and helpful owners&staff, great food, spacious room, all next to a beautiful beach. The entire staff was amazing, generous, and incredibly accommodating. I was overcome with a sense od peace the moment I set foot on the property. Amazing views and tons of character. Beautiful beaches and excellent suggestions from staff as far as activity and food recommendations. Absolutely wonderful. Not so easy to get there, but beautiful location, hidden among the trees right above the sea. Amazing secluded location! Friendly knowledgeable staff and fast service! lodging, rooms and design! Food! So good and so relaxing! Kali´s Casa over the Sea offers accommodation in Bastimentos and offers free WiFi. Simply decorated rooms feature a fan. Towels and bed linen are also provided at the property. Bocas Town is 3. Average score from 26 guest reviews: 7.6/10. Wonderful patio and hammocks, cozy rooms, great location. Basic but amazing wooden home over the water. Great deck with hammocks and chairs, lovely indoor seating area and kitchen. Hot water in showers. Beautiful place to stay. Nice view, room over the water. Could be better treated and care, but the staff was helpful and nice. Location is great, good Equipment of the kitchen, nice balcony with hammocks etc. very clean. Une petite maison sur pilotis de trois chambres avec une cuisine & un balcon à partager. localisation idéale les pieds dans l'eau, à deux pas du centre. Des chambres simples mais très charmantes. Très belle vue, extrèmenent dépaysant. Dopo un primo momento di sconforto dettato dal pregiudizio, si è aperto davanti ai nostri occhi un mondo incantato, semplicemente la realtà. Andrea, factotum di Kali's Casa, è il personaggio chiave della struttura. Se tutto funziona, è anche e sporattutto grazie a lui. Super leuk huisje aan het water! Erg toegankelijk. Après avoir un peu galérer pour trouver la chambre (il vous faut demander Raphael et non kali's, sinon vous ne trouverez pas !!) l'endroit est propre, avec vu sur la mer ! Il y a même une cuisine et une terrasse surplombant la mer avec 2 hamacs et une table pour manger. C'est vraiment TOP. Il y a aussi des ventilateurs très silencieux, c'est agréable de jour comme de nuit. Vous trouverez une balancoire pour se balancer au dessus de l'eau ! Pour ceux qui souhaiterait aller voir les "reds frogs" il vous faut aller redfrog beach et sortir des sentiers battus ( on peut souvent lire des commentaires comme quoi les personnes non rien vue...) si vous aimez la nature vous allez vite reconnaitre leur chant et en allant dans la "jungle" vous allez vite mettre le nez dessus, un beau rouge de la taille d'une phalange ! Bref, super bel endroit, je vous le conseille. 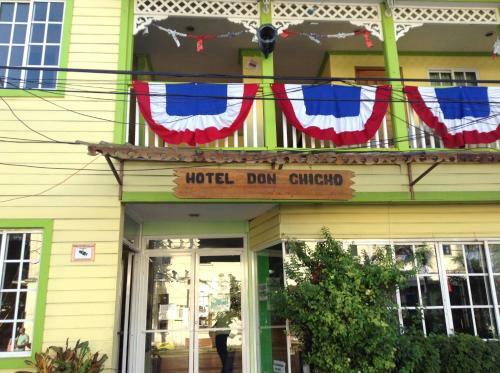 Offering a restaurant, Hotel Don Chicho is located in Bocas del Toro Town Centre, only 200 metres from the main beach. This simple hotel features laundry facilities and free Wi-Fi. Average score from 17 guest reviews: 7.5/10. don chicho is located at the perfect spot. You can walk everywhere within 5min and you are far enough to sleep well. There is also a laundry service for 4 dollars you can use. The W lan is fast. The rooms have everything you need and you get towels and soap. there is a liltle veranda with coaches were you can chill and talk to other travelers. Staff was very friends and helpful, let me store the bike I rented in a safe place and were very helpful w wifi and directions to places. The room was VERY clean and cleaned daily with fresh towels and sheets changed every second day. Looks true to pictures. MUCH smaller than expected. The bed was about the size of the room. The front desk guy had a little box and a chair set up under the stairwell. Clean place to spend the night right in the center of Bocas. Just don't expect any luxuries of any sort. Perfect location, right in the main street of Bocas Town. Staff somewhat friendly. Limpiaban la habitación y cambiaban los paños todos los días y muy honrados. Alsibiades Apartment offers accommodation just 5 minutes away from Bocas Town. Guests benefit from balcony. Free WiFi is available . Alsibiades Apartment is a spacious two bedroom apartment built over the water. Average score from 41 guest reviews: 7.3/10. Loved the location over the water. Such a relaxing place to spend some time and lap up Bocas from a laid back location. Quiet location away from noise of the town. Hammocks on deck. Apartment was clean and spacious. Had everything you needed to cook full meals, quiet location out of the town. I like the fact the apartment was right on the water alot of cool breeze. Staff helpful and friendly. Location quiet and less than a dollar taxi for centre. Elke dag schone handdoeken. Zijzicht links en rechts op het water. Goeie ligging, ongeveer 15 minuten wandelen naar het centrum. Buiten de drukte maar op goeie loopafstand. Met de taxi 1dollar naar het centrum.Een supermarkt om de hoek, strand op 5 minuten lopen. Uitstekende service. Tijdens ons verblijf is een hangmat kapot gescheurd. Dit werd direct vervangen.We hadden het erg naar onze zin. Ruime keuken, voorzien van alles wat je nodig had, koelkast gasfornuis en keukengerei. We hebben ons verblijf dan ook verlengd. Chalet Tio Juan is a charming four bedroom Chalet. Located in the heart of a small neighbourhood called Saigon, just a ten minutes’ walk away from Bocas Town or a $1 taxi ride. Chalet Tio Juan is hidden behind a tropical garden. Average score from 90 guest reviews: 7.2/10. Super clean, nice staff, easy to find and convenient location. The staff and volunteers make the place great! They are so kind, friendly, and helpful. The location is nice, just outside of the town center but still close to everything. The room is very comfortable. It has a great outside sitting area and the double kitchen is very convenient. The staff were super helpful and the book they had in our place about all the stuff to do, etc. was SOOOO amazing!! It really helped us figure out some fun activities! The kitchen was great and well kept also. The location is very convenient - only a 10-15min walk from downtown, which some people told us was too far but don't believe them! It was also nice to rent our bikes right from the hostel - but do it early! Convenient to get out to all the nice beaches like Playa Buff. The house is around 8 mins walking from the Bocas Town. The reception, where you pick up the keys, is right next to it. If you ask for the direction in the town people either don't know or they'll tell you to get a taxi as it is far... We decided to walk to the property anyways and it took us around 15 mins, there's no need to get a taxi. The room itself is nice and clean. The bed is not bad either. There is a kitchen and a small front garden where you can sit down and eat. Very nice colorful shared accomodation. Good valua for money with a booking.com ¨deal of the day¨. Nice veranda with hammocks and chairs, big kitchen. The room was clean, cozy and nicely decorated. Good wifi, great value for money. The staff is very friendly and ready to help you making the best out of you stay in Bocas del Toro. The place is 10-15 min walk from port and main attractions in Bocas Town. Lovely quiet chalet out of town. Great value for money. The triple room was comfortable, clean and with two good bedrooms. A queen bedroom The staff is wonderful and they also offer a 6$ 24h bike rent that highly suggest. Affordable and comfortable accommodation in a quiet location. Jenny was very helpful and friendly. We very much enjoyed the company of fellow travellers staying in our chalet. Having the facilities to self cater was great. Perfect accommodation for a couple if seeking somewhere chilled and away from the maddening crowd. Lovely double room with sink. Kitchen had all the essentials and nice outdoor hammocks and area to relax. Bikes available to rent and great way to explore the island. Had a fab stay! 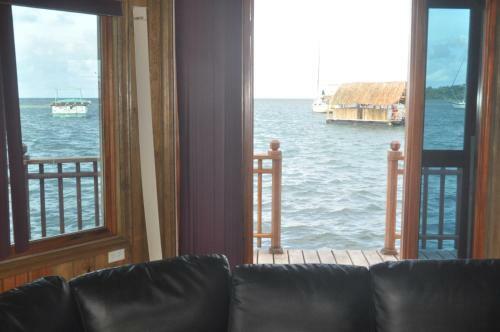 Set in Bocas Town on Isla Colon, this air-conditioned apartment features free WiFi and a balcony. Bright and Breezy Condo boasts views of the sea. Free private parking is available on site. Average score from 432 guest reviews: 9.9/10. Villa Sevilla is located in Big Creek, 2.7 km from Bocas Town. The bed and breakfast has an outdoor pool and terrace, and guests can enjoy a drink at the bar. Free private parking is available on site. Average score from 42 guest reviews: 9.8/10. Breakfast, pool and bar. The owners are the best--professional and very friendly. Lots of local knowledge. Del hotel nos ha encantado todo : su ubicación,ya que esta en plena naturaleza y al mismo tiempo de muy fácil acceso desde el Bocas town ; sus instalaciones, que están muy bien y muy limpias ; pero lo que más nos ha gustado ha sido el trato recibido por sus dueños, son una pareja estupenda y super atenta con todo lo que necesites. Mayra et José sont des hôtes exceptionnels et très attentionnés. Le cadre est vraiment beau et paisible, avec des petites plages propres à proximité où vous serez souvent tout seul. La piscine est un plus, surtout pour faire quelques longueurs une fois la nuit tombée. Convient parfaitement aux voyageurs solo. Muchas gracias Mayra y José ! Excelente atención de los dueños, muy limpio, tranquilo y cómodo. La piscina y el desayuno muy buenos. Mayra y José son unos excelentes anfitriones, la atención fue increíble y siempre dispuestos a ayudar con todo lo que pudieran, dándonos información de lugares para visitar y recomendaciones. El lugar es muy agradable y cómodo, la piscina es deliciosa y te sientes dentro de la selva con todos sus sonidos de pájaros y animales, sin embargo el lugar es muy seguro, la habitación es muy cómoda, perfecta para descansar después de un día de playa, la cama es confortable y el baño siempre limpio. La playa queda cerca y el alojamiento es cerca del pueblo, si te gusta caminar, puedes incluso llegar caminando, son aproximadamente 45 min de hermosos paisajes y el mar a un costado. También puedes llegar en bici, son 15 min o menos o en un taxi que te cuesta $2,50 por persona. Justo al frente de la salida de la Villa hay un muelle en donde te pueden recoger los taxis acuáticos, también es un lugar muy bello. Quedamos muy contentos y esperamos regresar pronto. El entorno y la atención de los dueños, espectacular, volveremos ! Located in Bocas del Toro, this private residence offers the guests a unique accommodation with free WiFi access. The Palmyra is completely surrounded by a beautiful garden which guests can access through their private patios. Average score from 75 guest reviews: 9.6/10. Super cute house, great location, very clean, spacious bathroom and private garden. The owner is a wonderful person that made our stay even more special. Nice host, free bicycles, clean room, chill atmosphere. Great location, well organised, superb facilities, Felicitas is wonderful, free bikes! Initially I thought staying by the airport and away from the beaches wasn't quite for us, but I'm glad we took the decision to try it, everything is really close by and the only planes using the airport are small ones about once a day... we didn't even notice them. Don't pay big prices to stay on the shore, the sand flies are annoying down there! Felicitas has thought of everything, there are cute umbrellas for tropical downpours, everything you need in the kitchen and a little hose off area for getting rid of sandy toes. Felicitas was incredibly helpful, always on hand and nothing was to much trouble. She made us really feel welcome and at home, so much so that we stayed an extra two nights! The room is well equipped, spotless and the private terrace is perfect for chilling. The kitchen is well thought out and has everything necessary to cook a nice meal. The bikes are a real bonus. We've been travelling for three months and this was comfortably the best place we stayed. If you could score 11 we would! Our host, Felicitas, was wonderful and went above and beyond to make our stay feel very special. Free use of bikes provided us with mobility around Bocas. The room and the common areas were spotless and a real oasis after a day out on the beach or in town. Felicitas had great information available on local sights, tours and services. Felicitas welcomed us in the most pleasant way explaining everything about her beautiful hostel and the activities in Bocas. The place was spotless and one can tell all the passion and care that she took to design and decorate it (she did everything herself!!). Additionally, an item of mine was stolen when we were out in town and she went out of her way to try and find it. The place and her make this hostel an absolute gem. Great host, super clean, great location, beautiful garden and grounds. Tasty mangoes! A beautiful and cozy home with many thoughtful details that go WAY above and beyond. Some of my favorite features were the private outdoor space (for each room! 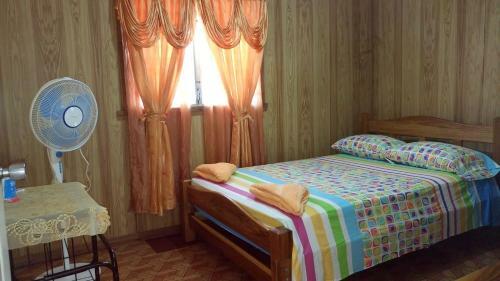 ), cheerful colors, and it's great location close to the airport but away from the noise of other travelers. The house is ultra clean and organized and has everything you could possible want (and more). Felicitas is the sweetest and most helpful host. Thank you!!! The apartment is very nice and clean, good bed, big shower, beautiful garden, a kitchen and bikes you can use. The owner is so friendly and helpful. Location is also great with 2 great breakfast options around the corner. The area is nice and quiet, with the hustle and bustle of Bocas town within walking distance! 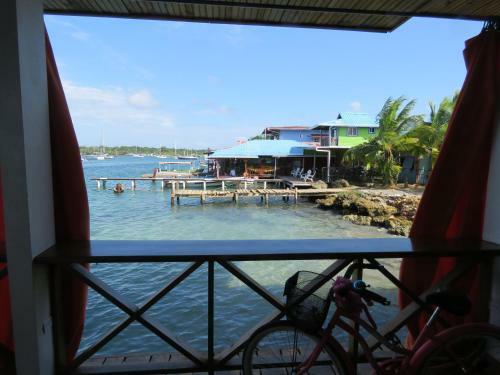 STAY Bocas is conveniently located right next to the airport of Bocas del Toro. Offering 6, simple, clean, comfortable guest rooms with en-suite bathrooms. All rooms and common areas have WiFi, fans and air conditioning. Average score from 259 guest reviews: 9.3/10. We really enjoyed our 4-night stay in early March 2017. We received a warm welcome from our hosts and excellent recommendations of what to do during our time in Bocas. It's a laid-back, pretty location - easy to linger over breakfast and plan for a fun day. Our room was simple, clean, air con, great shower - just what we needed. There are little touches that make the stay feel special like bikes, places to dry your towel and bathing suits, a welcome drink and yummy breakfasts. Our hosts really made us feel welcome and at home. The location is great as it is a quick walk to the main area but in a private, quiet part of the neighborhood. There was street construction when we were there but we were warned in advanced and it didn't affect the quality of our stay. Highly recommend STAY Bocas! Everything was perfect. The Dutch owners know pretty well what tourists are looking for : a warm and friendly welcome, a smile in every circumstance and with every one, small but modern and super clean rooms, exceptionnally comfortable beds, a harty breakfast of yogurt, muesly and fresh and delicious fruit à volonté to be enjoyed in the comfy sofas of the terrace. They give us interesting tips, arrange a reservation for a parking lot before taking the boat to the island and welcomed us with an unexpected discount. STAY BOCAS definitely contributed to make from our 2 days on the island an unforgettable experience. Thank you. Nice owners, great healthy breakfast and very clean rooms. Clean and comfortable rooms. Very friendly and helpful hosts. Best showers in Bocas. Loved the free bikes. I was only there for a day but the room was top notch! Clean sheets, hot water, and friendly staff. This was like a home away from home. Everything was incredibly clean. Also it was very safe and secure. Each room had a safe box and the owners are the only staff on site, meaning they also clean the rooms. This made me feel very comfortable about the security of my belongings while I was out enjoying the islands. Fantastic location, only 10 min walk into the town and you barely notice the airport next door. Owners Marcha and Chris were great!. Super helpful with recommendations and suggestions of things to do. Location of hotel is very close to airport but it did not bother us at all while we stayed there. Breakfast was healthy and great wifi service throughout the hotel. I highly recommend it! Everything: silent and clean room, simple but design style furnitures, confortable bed with soft linen, quality breakfast. Location is perfect: near the city center but in quiet street and near the airport. The owner are so kindly passionated of their work and so helpful for every information you need. So true. Pure love! Comfortable bed and room. Great decor throughout. Free bikes. Healthy breakfast. 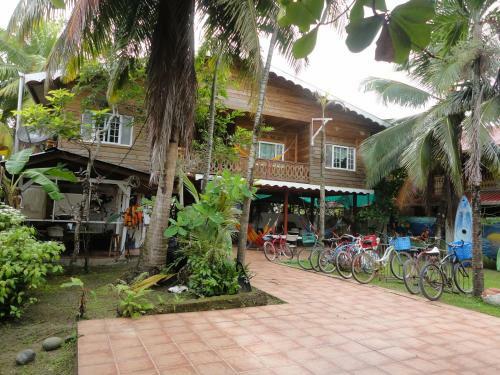 Located in Bocas Town, 100 metres from Bolivar Central Park, Bocas Condos Rentals offers bike rental and a furnished terrace. Free parking is available. The apartment will provide you with air conditioning, a balcony and a seating area. Average score from 392 guest reviews: 9.1/10. We arrived very early after taking an overnight bus from Panama City. The owner was kind enough to come over and let us store all of our luggage in a secure area and there was a bathroom there that we were able to use to get changed as well, which was so perfect. When we returned later we were really impressed by how huge our room was! The bed was spacious, the kitchen was fully stocked and the bathroom was quite nice as well. There was a lot of room to mill about and a nice seating area at the kitchen to eat at. The owners also helped to answer our questions about activities and things to do in the area. Frida was so accommodating and helpful with our constantly changing travel plans! Frida was the best. She was very nice and helpful. Very attentive and helpful in trying to make my stay pleasant. She arranged a tour for me too and gave advise on places to go. The place was nice, safe and comfortable. Clean condo with upgrade from studio to one bedroom. Friendly staff and owner. Great size room and close enough to the popular bars etc without being too close to hear the same. Very clean with plenty of room facilities. Owner lives on sight which is always useful. Only down side for us was that the windows were locked shut for security and so forced to use air conditioning which we don't normally use. Shame for the development that it has some reasonably noisy Panamanian neighbours (cockerels, radios etc) but hey-ho, you get a feel for the real Panama at the same time as staying in luxury accommodation! BTW if you want to book a day tour, use 'Under Sea Tours' (in the main street)... We checked out all the tours on offer... Under Sea were slightly more expensive than the rest ($10 more) but worth it. Brilliant location , lovely clean and a/c apartment. The hosts were fantastic. We would definitely recommend staying here. Located in Bastimentos, Eclypse de Mar Acqua Lodge offers private bungalows and rooms with individual hammocks and stairs that provide access to the ocean. A restaurant is also on site. Average score from 328 guest reviews: 9.0/10. The staff are fantastic, there are sloaths in the back garden, snorkelling on your private dock. Food, the tuna carpaccio was best ever. Just a wonderful place. Sugee was an amazing host. She was so helpful and informative. The island is beautiful, the rooms are great and the breakfast was amazing. I would highly recommend this hotel to anyone. it was a dream to stay in an aver the water bungalow and I wasn't disappointed. Really exceptionally beautiful place and very helpful and friendly staff. A cabana over the water, what could go wrong with that? Nothing. The staff was super, delivered our meals to our cabin, helped us find that mama sloth & her baby in the reserve right behind the hotel. The rooms were comfortable, roomy and with the nice breeze off the water it was just right. Great staff and fantastic location. You see the most fantastic animals undersea right here! Ultimate service! This is the best place in Bocas, hands down. You must stay here. Period. Everything was super, super and super. Location, staff, food, room, service! Everything you can come up with! I highly do recommend this place! Don't even think about other options: Go ahead and book this! Service from every member of the staff was so nice from the time I stepped on to the dock till the end I left the place. Food absolutely delicious. Kayaks you can borrow whenever you want. Stunning nature reserve is just steps away. Room so clean and cozy. Hot water with high pressure in the shower. The list could go forever. Will be coming back! Definetly. I found the Hotel staff very warm and helpful,they treated us in an excellent manner always looking after our needs.The cooks really cook with love the food was excellent and served with caring hands. Located 700 m from Bocas del Toro Airport and its city centre, Hotelito del Mar offers a Continental breakfast for an extra fee, which consists of coffee, tea, fresh juice and fruits, and homemade muffins. Average score from 68 guest reviews: 8.9/10. Everything is newly painted and beautiful. New owner has improved it a lot and has more plans. Quiet and great food right next door. The location was perfect, and the staff was very helpful! It was perfect. Nice location, very clean and neat rooms. Staff is cool and helpful. Wonderful owners!!! Super helpful- speak fluent English and willing to do anything to help their guests. The rooms are basic and minimal but all you need given that you'll be outside enjoying bocas 99% of the time anyway. Great value! Great location and value for money, very nice staff. The bed was comfortable and the room was very clean. The A/C worked very well. Staff was friendly and courteous. The pet parrots were a hoot. Great location. Very friendly and helpful staff. Clean and comfortable room. Moved to a bigger room due to some issue but price remained the same. Los Balcones Over the Sea features a unique palafitte-style structure over the sea in Carenero Cay, in the paradisiac Bocas del Toro islands. It features a private jetty and a daily breakfast is included. Average score from 178 guest reviews: 8.4/10. Owner and staff we're excellent. Room with balcony was perfect. Excellent burgers in the restaurant. I stayed at 3 other places during my trip to Bocas and this was by far the best. Highly recommend. the owner and staff were great to make everything we needed pleasant and were very willing to help on any info on anything we wanted to know about the islands. Wow, what can we not say about our 4 days here. The breakfast was good and enough. The location was beautiful and calming. The staff was great and the owners were excellent and fun to be around and talk to. The weather was perfect for our needs and the Superbowl gathering was small enough to enjoy the game and the other guest. Can't wait to return. Everything, The staff is very kind and helpful, the location is great because is near the main town (1 usd boat taxi), breakfast is really good. Kieth the owner was on hand to ensure you were well looked after. Very friendly and large comfy rooms just away from crazy Bocas Del toro but close enough to pop across for a drink or supplies. Water taxi too and from Bocas was only $1 per person. The second floor suite is awesome, have a great balcony and for a reasonable price. Also like that breakfast is included. Free breakfast was always fresh and delicious. Husband and wife owners were as friendly and accommodating as can be. They made us feel so important and welcomed. Great location! Only 1 minute water taxi ride to main town island colon. The location was amazing- right over the ocean and away from noisy Isla Colon. It was easy to travel to from other islands. The owners were incredibly warm, welcoming and accommodating. They arranged transportation for us daily. The rooms were clean and comfortable. Will definitely stay here again. I recently stayed at the Oasis and had a great experience. Jose and Maira were very accommodating and friendly, The hotel is a 1 minute boat ride to Bocas Town but it's far enough away to enjoy some peace and quiet. I'll stay here again. Located in Bocas del Toro, Kevin Kondos offers fully equipped apartments with free Wi-Fi and access to a private beach area. The property has an on-site restaurant. Average score from 74 guest reviews: 8.3/10. Nice white sand beaches just 1 km far from the property where you have a good chance that you'll be totally alone. The island is in general not overcrowded. the apartment view: 2nd floor, full front sea view. Also, Isla Carenero is quit peaceful and relax, contrary to what other reviewers may have said (or maybe was because of the season we went in), but overall, the island itself is nice, few other hostels for surfers and a bar over the sea where apparently is the place to be at during Saturdays (Aqua Lounge). Also happy hours! The kitchen facilities for me are very important with my multiple allergies. They have anything you need in the kitchen. The condo was nicely outfitted. i have severe food allergies so it was nice that i had everything i needed to cook there. Beds were very comfortable and close to some fantastic beaches and restaurants. The location on the map was wrong and its better in reality. Lies on the southern tip of carenero very close to bocas town. Great view, walking distance to the supermarket, very clean and spacious apartment, the grounds were well kept too, good wifi. Easy to get a water taxi from the jetty directly in front of the property. Water view, $1 ride away from the main island (we payed anything from $1 to $2 actually). Spacious aparment, comfy beds, good air conditioning. Internet was very good. Kitchen was fully equipped and quite good as well. You can get to the supermarket on Carenero island on foot in 5 minutes and around the same time to Bibi's place. Manager was very helpful. Fronted on water and quiet. 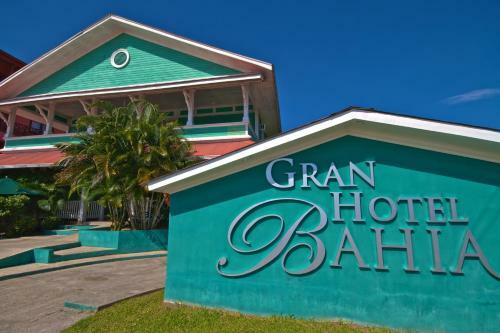 Gran Hotel Bahia is 450 metres from Simón Bolívar Central Park and 2 minutes’ drive from Bocas del Toro International Airport. It features free WiFi and a free daily Continental buffet breakfast. Average score from 84 guest reviews: 8.1/10. Relatively quiet. Lovely balcony. Directly across the street from a great water taxi company and two doors from a grocery. THE VERANDA WAS A WONDERFUL PLACE .TO RELAX & VISIT. .SECOND FLOOR E OVERLOOKING THE STREET & VIEW OF WATER. The location is great, in the Town centre. The hotel rooms look great and comfortable. Staff is helpfull and friendly. The breakfast is simpele but good. El hotel esta impecable, el servicio es excelente. Edificio antiguo muy bien conservado, trato amable del personal, desayuno continental en el balcón, muy buenas las opciones con vista agradable y confortable. Por las noches música en vivo afuera del hotel con buena comida del restaurante. El hotel brinda un shuttle del aeropuerto al hotel, esto te brinda tranquilidad al llegar al aeropuerto si es primera vez que viajas a Bocas. El trato es agradable y muy personalizado. Las habitaciones acojedoras y grandes con espacio para todo. Tesoro Escondido Guest House is set in Bluff Beach, 5 km from Bocas Town and 26 km from Buena Vista. Guests can enjoy the on-site bar. Free WiFi is available and free private parking is available on site. Average score from 9 guest reviews: 8.0/10. Set on Carenero Beach, Careening Cay Resort has a beautiful location surrounded by jungle. It has a restaurant, and bright accommodation with sea views. Average score from 177 guest reviews: 7.9/10. We loved the quiet isolation and funky place. The colors were so cute and I just loved the calm vibes you feel, made me want to smile all the time since it just seems like such a happy place, only way I can describe it! Great gift shop too. So many simple little things were fun to experience. Watching their dog who loves to jump into the water for swims. The pretty conches all over. How all the rooms have their individual decor with matching names. Just fun sitting around the pleasant atmosphere and longed to be able to stay longer but instead of with a friend I'll come back when I can bring my husband! He loved the pics and is looking forward to it hearing how much I loved it! The highlight of the experience is getting to live my bedtime visualization - being in a hammock w/ a Marguerita and watching the waves go by!! Sunset time to boot!! Nice friendly family who runs it too! This is our second time staying at Cosmic Crab. We love the over the water cabinas and the peacefulness of the water. The staff is fun. The food is great in the restaurant. Best views of sunsets too. I loved that breakfast was included in the price and it was tasty too. The food and drinks menu was extensive and also good value. Joan was very welcoming and accommodating. Our room on the jetty was amazing. I would recommend spending a touch more for the pleasure of being on the water. The room was clean throughout and the bed was comfy. We also got nice towels for the bathroom and free beach towels to use in addition, which was a nice touch. The location was great and there was always a taxi boat at our service, just a quick phone call away. Cosmic Crab is definitely a happy place for my husband and I. A convenient location with a spectacular view! We love the cabinas over the water and the food at the restaurant is delicious. Charming place. Right on the water. Restaraunt was a relaxing, fun place to hang out and food was good. The staff was excellent! The room was small, but right on the ocean where you can wake up to see starfish! Happy hours were great too! Location was great - view of fireworks from Feria Internacional del Mar was incredible! Really loved the breakfasts. We have stayed there twice now, and both times it was great! Just enough off the "beaten island" to have some privacy, but plenty still going on. Everyone very friendly, and just a quick call from the bar phone gets you a water taxi to Bocas Town. Woohoo! Friendly staff, comfortable rooms for the price, great location, good ambiance. Situated in Bluff Beach, this double features a balcony and a garden. 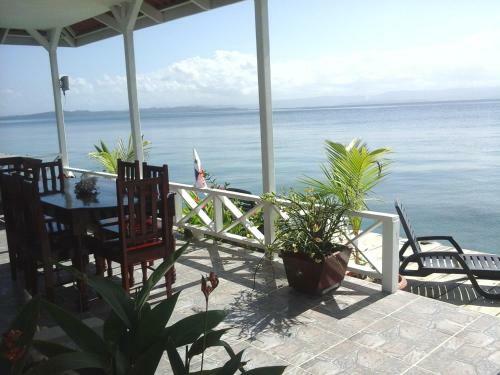 The property is 6 km from Bocas Town and features views of the lake. Free private parking is available on site. The kitchenette is equipped with a fridge and a stovetop. Average score from 303 guest reviews: 7.9/10. 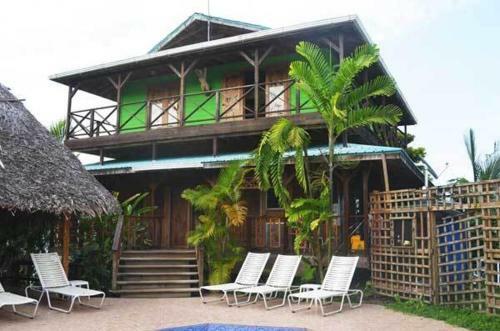 The Bocas Beach House is a charming Caribbean-style guest house located on the seafront in Bocas Town. It offers simple rooms with free WiFi and a terrace with hammocks overlooking the sea. Average score from 39 guest reviews: 7.8/10. Dreamhouse! with your own pier and beach! its 7mins from bocas town by foot - therefore no noise! its an absolute pearl on the island (I was not successful at all finding a good hotel in bocas) There is no reception - however not a problem at all as owner immediately write you when you have a question. actually I loved the freedom Also the dogs outside in the street that everyone said are harmless. myself im very scared of dogs and they did not even come near me. Its super nice you got ur private Beach the owners are awesomly friendly and will help u with everything u need they even offer u a nice and cheap water refil next to their house. Everything is just perfect i Would come back any Time!! Excellent Hotel, nice stay with my girlfriend for 4 days. The owner Benzin is very helpful on anything you need so that's really nice. Thanks for everything! 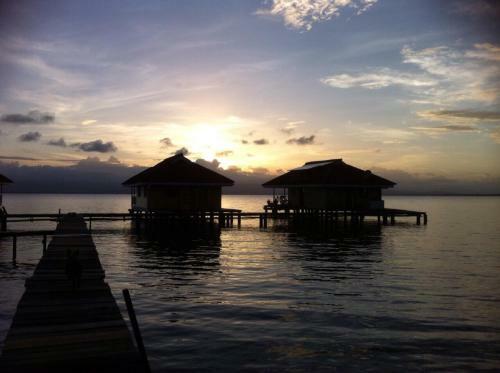 Superb place for relaxing stay in Bocas with own pier. There is only 3 rooms and very home atmosphere, you can use kitchen, listen music and have drinks. Very comfy for long stay. A lot of crabs for watching and feeding. Not far from the house lives lady who bakes cakes and sells on afternoon. The location is awesome, within walking distance of the centre, with its own deck and private beach. The room was good and confortable, the kitchen was very well equipped, and even though the bathroom is shared between 3 rooms, you don't notice it. Checkin was also a breeze. The Bocas Beachhouse offers a wonderful view over the Caribbean sea which makes it a great, calm place stay. The interior design is very creative and the beachhouse offers in fact everything in order for you to relax. Nice view from the veranda over the bay, the Beach House is a bit outside of busy and loud center of Bocas but still in easy walkingdistance. Nice beach house for a relaxing stay. The lounge area is great! We sat there for ages. The kitchen is well equipped. You have direct access to the sea, and the main part of the town is not even 10 minutes away. We definitely enjoyed our stay there. Location was 10 mins to the centre of town and there was a dock to jump into the sea. The bathroom was nice and clean as was the bedroom. Camila, die Gastgeberin war supernett und hilfsbereit. Wir waren 4 Tage da, 2 davon allein ohne weitere Gäste. Das BeachHouse ist 10 Minuten zu Fuß vom Trubel entfernt. Man kann also abhängen und feiern. Supergut. Located in Bocas del Toro, Bahia Del Sol is a very calm and relaxed B&B that offers free WiFi access and a free daily breakfast. Each room at Bahia Del Sol features bed linen and a private bathroom with a shower and a hairdryer. Average score from 64 guest reviews: 7.8/10. Lee and Jack are great hosts. Their place is beautiful and it's a perfect escape from town when it's really busy (we were there during Carnival). And it's a short ride back to the action when you want to be in the middle of it. Jack's breakfasts were tasty and plentiful - a full plate with something different each day. He's very creative in the kitchen. We loved spending time on the back dock relaxing or working - they have a good wifi connection if you're a digital nomad. You can see all kinds of fish right under the dock. A great place to stay if you want to chill out. They offered to help us book any tours or boats that we needed. We didn't take advantage of their services only because we had been in Bocas for a while and done several activities. I liked the staff. Lee and Carl and the other ones were amazing and very kind. Breakfast was delicious and complete. We absolutely loved our stay with Jack and Lee. It was all we hoped for and more! Jack and Lee are fantastic people. This was not our first time in Bocas del toro but it was by far the best. Jack's breakfasts were to die for. Something different everyday. Jack my favorite was your french toast. They also know everyone so getting anywhere was not a problem. We went snorkeling horseback riding we went on the chocolate tour and many other great things. We will be back hopefully in March. For those of you expecting a Hilton type experience this may not be for you. But if you like being outdoors and/or surrounded by water doing outdoor activities you will be in heaven. To sum it up we spent our last day in the city of Panama and the locals call Bocas del toro paradise. We could not agree more. See you soon. Near to town, but not in the center where the noise is. 1$ per head taxi ride to town. Nice water location. Jack's breakfast's are home cooked and different every day. Both Jack and Lee are more than accommodating, calling taxis, restaurants, advice. -the B&B is beautiful; i wouldnt't even call it so, it is rather a home! -Jack and Lee are perfect hosts, they gave us a lot of tips and are always there for a chat -the breakfast is delicious -we highly recommend it! Jack and Lee (and Zorro) were great hosts. Jack even woke up before the sun to make sure I had breakfast for my early shuttle ride. The room and shower were clean. They make you feel like home. The outdoor activities like kayaking and SUP. Hotel Laguna is located just 110 metres from Bocas del Toro waterfront, and only 5 minutes’ drive from Bocas del Toro Airport. 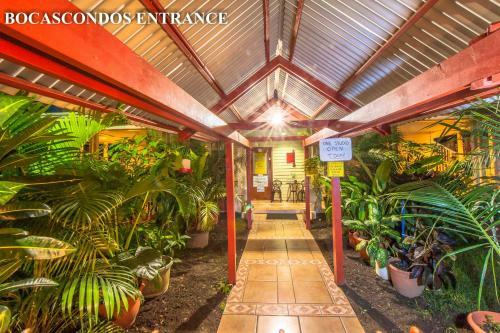 The property offers free Wi-Fi connection throughout. Average score from 15 guest reviews: 7.8/10. Located right on the coast, Apartamento en Bocas del Toro offers an outdoor pool and a private balcony overlooking the Caribbean Sea. This modern apartment features free WiFi. Average score from 88 guest reviews: 9.8/10. Offering an outdoor swimming pool and a private beach area, Garden of Eden Bed and Breakfast is located 1.5 km from Red Frog Beach. Free Wi-Fi access is available in public areas. The rooms here will provide you with a balcony, linen and a fan. Average score from 18 guest reviews: 9.3/10. Everything was just amazing! The moment we arrived onto the island we were greeted by the very lovely owners Sue & David. We spent the next 4 days in Paradise with 3 course meals every night, drinks by the pool and days out kayaking & swimming. Out of our 2 weeks vacation, Garden of Eden was by far the highlight. Miguel the chef created some spectacular dishes and Sue & David's baking was wonderful - nothing at all was too much effort and we really appreciated their warmth and good chats! The room we had overlooking the sea was spectacular and we can't wait to come back! Words really cannot express how great of a time we had! Garden of Eden is a beautiful place with a wonderful crew. The service was very well and the food was of very high quality. Surrounded by nature and sea gives makes you instantly relax. If you look for high quality holiday, this is the place !!!!! The Garden of Eden is what it says on the tin; we truly felt that we found a perfect place with lovely members of staff. The B&B is cosy with only three bungalows available with all rooms facing the ocean and we loved how personal the service was we received throughout our stay. The food was provided by a dedicated chef for the resort, the quality of which could only be compared to the finest restaurants. Su and Dave, who run the place, were very much like parents to us (without any of the annoying bits); Su helped us with planning our daily activities and Dave often gave us a ride and picked us up from the neighbouring islands we visited during our stay. There is also a games room on site in the middle of the rainforrest for the times guests just want to relax. The place has a truly Caribbean feel to it with humming birds, possums, geckos and many other Panamanian wonders around. We are already planning our next trip back. We felt welcome from beginning to end. The cabins were well maintained and had great water pressure. They had a game area with a pool table, dartboard, chessboard and boardgames. Todo en el hostal estaba en orden y limpio. Excelente servicio lo recomiendo. La comida deliciosa. Su und David sind einfach sehr sehr nette Menschen. Mavis und Zeus sind einfach sehr sehr nette Hunde. Miguel, der Koch, ist super und Ashley, der gute Geist, hilft wo sie kann. Wir hatten überaus entspannte 5 Tage auf einer einsamen Insel in der Karibik. Essen, Schwimmen, Kajakfahren und Schnorcheln. Eine ausgezeichnete Unterkunft!! Perfektes Service, nettes und hilfsbereites Personal. Wunderschöne Lage - eine Insel auf einer Insel - absoluter Erholungsfaktor!! la amabilidad de las personas. La atención es excelente y la comida también!! Gracias Su, David, Conor, Emma y Miguel!! Located in Bocas Town, 2.9 km from the town centre, Paraiso Escondido features a barbecue and views of the sea. Free WiFi is available . The accommodation comes with a TV and CD player. All units have a terrace and/or balcony. Average score from 11 guest reviews: 9.3/10. I booked 2 nights in this amazing house and left feeling sorry I could't stay for another couple of days. The house is wonderful. It is very clean and fully equipped with everything you need to make your stay as comfortable as possible. The owners Poli & Lyo couldn't have been more pleasant. They were very helpful with the accommodations from our arrival until our departure. As soon as you step into the house is hard to miss that the owners take excellent care of the property, Everything is clean and in perfect conditions. The location is amazing. We spend an entire afternoon snorkeling around the premises. we saw a great amount of beautiful corals and colorful fish. The staff is very friendly and helpful. I give this place a 10/10 because it is indeed a hidden Paradise. We are definitely going back!!! Great: long coral reef directly behind the house, swimming and snorkeling from the deck, functional equipment and asthetic furniture, especially the glassbottom and the wooden floors, calm area, rarely boat traffic, nice and allways communicative and helpfull owners, one free transport to Bocas Town per day at 11 am and back at 2 pm. Um es mal vorweg zu nehmen,,es war absolut traumhaft und für uns einer der schönsten Orte in Panama.Wer sich erholen möchte und Ruhe sucht ist hier bestens aufgehoben,wer sich hier nicht entspannen kann ist verloren!Ein Haus auf dem Wasser,kein Lärm,eigenes Riff unter sich,ein voll ausgestattetes Haus mit Küche,2 Schlafzimmer,2 Bäder,traumhafte Lage,was will man bitte mehr?Man kann hier stundenlang schnorcheln,auf der Terrasse liegen oder was auf immer.Wir waren sehr traurig diesen Ort wieder zu verlassen,aber wir werden definitiv wieder kommen!Einen ganz lieben Dank an unsere tolle Gastgeberin Poli,Vielen Dank für diese außergewöhnliche Erfahrung,es war fantastisch Ps. :Es gibt dort kein Geschäft,deckt euch mit Lebensmitteln ein.Täglich fährt ein Boot nach Bocas. Un lugar absolutamente privilegiado, perfecto para el descanso, el silencio, la tranquilidad y la naturaleza. Una casita preciosa sobre el mar muy cuidada en los detalles. No tuvimos ningún problema. Poli y su marido, los dueños, nos trataron muy bien y se preocuparon de que no nos faltara de nada. Una experiencia propia del caribe inolvidable. Seguro vamos a volver. Die ruhige Atmosphäre. Die Bade- und Schnorchelmöglichkeit rund ums Haus. La ubicación de la casa tiene una vista espectacular, sobre el mar. Es perfecto para descansar, nadar con peses y apreciar varios animales marinos. Los dueños son adorados. This bed and breakfast on Bluff Beach features a beach front 65 foot long lap pool. Complimentary items such as WiFi, cell phone, bicycles & snorkels are provided. Property is located 9.6 km from the center of Isla Colon. Average score from 53 guest reviews: 9.2/10. Ron, Steve and Karen went out of their way to help us have a great time In Bocas del Toro. The facilities are impeccably maintained, breakfasts were delicious and since they know most of the local tour operators they were able to line up awesome adventures (snorkeling, cave tours, etc) that were more personalized than the "cattle-car" tours that we saw most other tourists on. A rating of "10" does not seem high enough! These guys run one of the best places you can imagine! If you like being in front of the beach in a very quiet and friendly place surrounded by nature and happy people this is the place to stay! Very relaxed place, the breakfast is awesome!! They change the breakfast options every day that include lots of fruits, eggs, great juice and other surprises! Ron, Steven and the rest of the staff are all very friendly and helpful and try to help you with everything and keep the place in a perfect condition. One of the best places we stayed in over a month of travel around Panama and Costa Rica. -Pick-up after watertaxi -Arrived in the morning with the nightbus from panama-city. We could allready go into our room and got perfect breakfast -Veeery nice owners! Thank you Ron & Kristine, you made our stay very special!!! -Pool is great -Horseback-Riding -Free bikes! Bluff beach retreat is a true little heaven on earth. Situated in a secluded lush rainforest garden that is meticulously well maintained it offers direct access to the beach and a beautiful pool. Our room was spacious, spotlessly clean and the bathroom was beautiful. You always feel like you're in the heart of nature without having to miss out on basic luxury. The staff was amazing, especially Karen and Steve who took great care of us, always made sure we had everything we needed! The breakfast is amazing, fresh fruit, a delicious smoothie, homemade granola and eggs, what more could you as for?! We will be dreaming of this place for a long time! The house, the setting, the pool surrounded by beautiful plants and trees, the wildlife, the fantastic restaurant next door and falling asleep listening to the ocean. Meals and the resident dog who joined us in "yoga"! 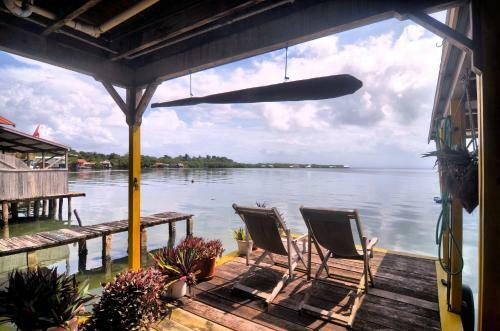 Located in Bastimentos, 3.8 km from Bocas Town, PUNTA RICA boasts a private dock, small beach and free WiFi throughout the property. Certain rooms include a seating area where you can relax. Some rooms feature views of the sea or garden. Average score from 118 guest reviews: 8.9/10. Located in in the Island of Colón, 9.5 km from Bocas del Toro town centre, Bocas Villas is a property set among a natural forest and the sea. It offers free Wi-Fi, in addition to free bicycle rental and city tours. Average score from 35 guest reviews: 8.8/10. The fact that you are in front of the ocean and in calm water and a beautiful coral reef. Manuel was a great contact who made our stay easy by securing our transit from downtown to the boat and to the cabins. Thanks also for the water and the well equipped villa. The area is fantastic, as it is well far from the city, which is still easily accessible. It is immensely relaxing and beautiful. The wildlife, the sounds of the ocean, the birds... This is paradise. Seclusion of the property. The scenery. Paddle Boards. Terrace area. Scheduled boat rides to town. It was exactly as pictured. Villa was beautiful, as well as its surroundings. Remote/secluded, as expected. Very serene setting. Kitchen was stocked well with all cooking utensils needed. Boat & driver available, free of charge, twice a day. Paddle board & kayaks available. Owner is very friendly and lives in one of the 4 villas. The property is right on a active coral reef perfect for snorkeling. We saw a lot of star fishes not far from the property. The size of the place is perfect. There were a lot of very comfortable places to relax, sit, lay down. Right on the water. Kayaks were great. The view was very good. If the weather is good the place will be great. The tranquility and serenity was outstanding. The size of the property totally met our needs and we had acces to everything we could want to do but not take full advantage of all the offerings. We liked the idea of staying in a villa on the water with a view. La tranquilidad del lugar... El mejor espacio para descanzar. Volveria de nuevo sin pensarlo. Accueil chaleureux, séjour reposant, cadre splendide. 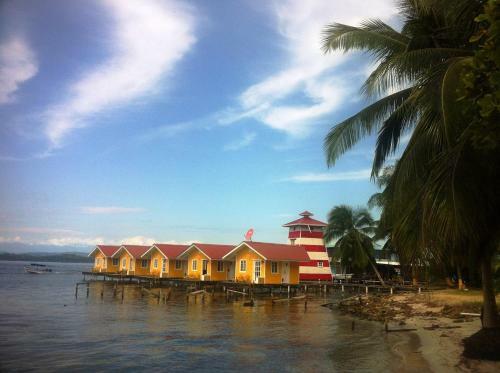 Featuring free WiFi and air conditioning, Isla Colon Cabañas is located in Bocas Town, 23 km from Buena Vista. Isla Colón is 8 km away. All units include a TV. Towels and bed linen are available. Isla Colon Cabañas also includes a terrace. Average score from 44 guest reviews: 8.8/10. This collection of eco-friendly wooden cabins is located on Panamá’s stunning Bocas del Toro Archipelago. Situated in the water, the cabins are built on stilts and feature a private balcony with a hammock. Average score from 75 guest reviews: 8.8/10. Absolutely worth it. I enjoyed every single time in there. The location was stunning, the food delicious and the staff very friendly. We had a wonderful time at Punta Caracol and would love to return any time. Strongly recommended! The location was amazing - secluded in paradise! The views were breathtaking, the staff was exceptional, the food was delicious and diverse, and the amenities offered were a good source for seeing different things the island had to offer. Overall we had a blast and would love to go back and visit! A special thanks to the staff for being so hospitable and going the extra mile to make sure everyone had a great stay at Punta Caracol! The staff was incredibly friendly and thoughtful. They went out of their way to please. And make us feel special. Very friendly staff, specially the owners (Pilar). The location is great if you are looking for a quite area. There are plenty of coral reefs around the hotel, a great place to enjoy snorkeling, and the hotel provides free equipment and kayaking. Located over the sea at Carenero Island, the Faro del Colibri features a unique aqua-style with a private beach area, wooden docks, free Wi-Fi throughout and activities such as snorkelling. Average score from 195 guest reviews: 8.6/10. Arriving by boat is very special. Private balcony over the water, it all felt very exclusive. The facilities in the room were perfect, and so is the location and the view. The bungalows are actually in the water (which you can swim in–just watch out for the stingrays at night). There was a deck with lounge chairs too. Breakfast was delicious. 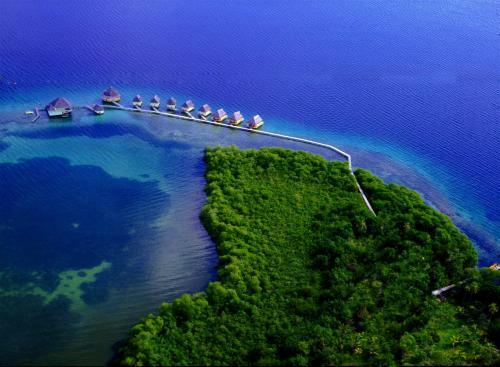 Charming suites built on stilts above the water, super quaint and entertaining to watch the stingrays at night. This hotel certainly is one of my favourites! It is situated right above the water. Lit underneath you are able to spot some fish not only during the day but even more so at night. The owner and staff were extremely friendly, the breakfast was awesome and Isla Carenero is just one of the best places to chill. The internet worked well in my little yellow house which I highly appreciated. I will definitely come back whenever I have the chance. These are amazing bungalows on the water just a two minute boat ride from Bocas town.The staff were wonderful and the owner himself rises early in the morning to cook you the freshest complimentary breakfast ever. It consist of local grown fruit, breakfast cake, coffee, juice, and your pick of entre from his menu. The bed was very comfortable and house keeping cleaned daily with the addition of fresh towels. I definitely will be staying here for my next trip to Bocas Del Toro. The location is stunning, the staff are very helpful, from booking tours to advice on which cabin to choose, to carrying luggage! The end cabin does have boats passing (it's a cabin on the sea after all) but it adds to the charm of a cabin on the sea. We saw rays passing every night we stayed & flying fish. Air conditioning worked perfectly. The main island occasionally had bars playing loud music which we could hear while we sat on the terrace at night but once inside we couldn't hear it & slept well. A modern and well maintained property; polite and cheerful staff; very good kitchen and owner very helpful and on site. On top of this a fantastic location. Staff is lovley and very helpful. A bit hard to communicate if you're not speaking Spanish. We loved the place. As you can see from other reviews is it lots of noise from taxi boats. But how often do you have the possibility living on the ocean. Close to Bocas Town and super easy to get a water taxis. Loved staying in the lighthouse. Great service restaurant...always smiling. The room was cute and right on the water. Breakfast was lovely. Staff was very pleasant. 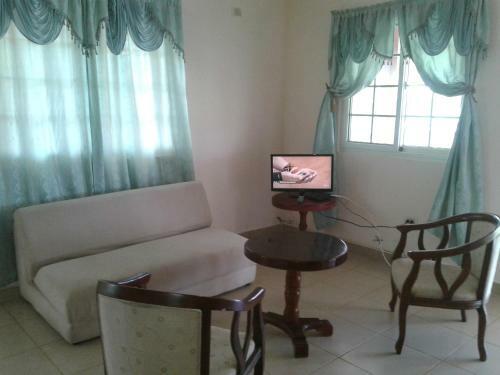 Located in Bocas Town, this air-conditioned apartment features free WiFi. Guests benefit from balcony and a sun terrace. Free private parking is available on site. An oven and a microwave can be found in the kitchen and there is a private bathroom. Average score from 392 guest reviews: 8.6/10. Jungle Hill Eco-House is located in Bastimentos and features an equipped kitchen and a lounge area with hammocks to relax and enjoy an amazing view to the Caribbean Sea. The accommodations feature a full bathroom with a rainwater shower. Average score from 16 guest reviews: 8.5/10. My husband and I loved our stay at Jungle Hill. It is a bit of a work out getting up there, but the view is SO worth it! The house is very clean and comfortable. We loved the big deck space and just being surrounded by nature. The private dock is a great bonus. We enjoyed relaxing in the hammocks and then hopping right in the water for some snorkeling. The free breakfast at Eclypse de Mar every morning was yummy (great toast and coffee) and a nice way to start the day. We loved the location too. It felt secluded and private, but Old Bank is just a short, $1 taxi ride away and Bocas Town is easy to get to too. Dayana and Malena were great hosts. They checked in on us several times via email during our stay to make sure we had everything we needed and to offer help with setting up tours. We forgot our nice filtered water bottles when we checked out and Dayana and Malena tracked us down later that day to return them. We are very happy that we chose Jungle Hill and highly recommend it! It is a real Jungle house. Lovely place, lovely view, very cosy and confortable! Très agréable séjour! Charmant Lodge avec très belle vue. Petit ponton privatif avec hamacs très agréable! le merveilleux cadre.le prêt des cayaks .L'acceuil du personnel. le petit déjeuner excellent et copieux. El hotel presta un kayak, los corales se encuentran muy cerca, de alli nos encontramos con un par de delfines, muy cerca del hotel. Desde la Cabana, alcanzamos a ver osos perrezosos, ranitas rojas. EL lugar es maravilloso. Le parfait refuge de Robinson dans la jungle avec une vue splendide et du confort. Maison très ouverte sur l'extérieur, aérée, matériaux naturels, isolée mais à 5mn à pied d'un hôtel et restaurant avec wifi gratuit et service aimable et accueillant. Accueil efficace et discret. Service de maintenance rapide. Geniales Haus in luftiger Höhe (ca. 15m hoch) am Rand des Jungles mit Blick aufs Meer. Super Frühstück im Eclypse del Mar (inklusive). Super große Terrasse mit Hängematten, Küche und Sitzgelegenheiten. Keine nervigen Tiere bzw. Moskitos. Vermieter waren super freundlich. Kostenloses Trinkwasser aus Wasserspender im Haus. La ubicación es excelente cn unas vistas envidiables. Además dipone de un pequeño muelle con dos hamacas con su parcelita de agua ideal para parejas. Es una linda experiencia, estar alejados del pueblo, para vivir la tranquilidad de la naturaleza. La casa es muy bonita, con excelente vista, está creada de forma ecológica. Las chicas que la arriendan son muy amables, están dispuestas a ayudar en caso de cualquier problema. Además hay un restaurante cercano, donde se toma el desayuno y se puede comer. 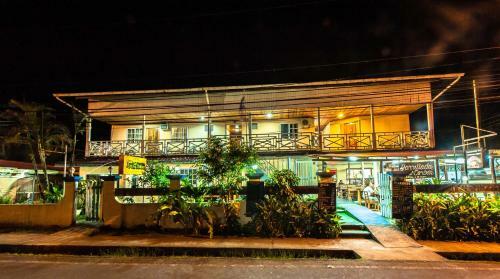 Hotel Palma Royale is located on the main street of Bocas town, on Colon Island. Just a 5-minute walk from the beach, it offers air-conditioned rooms with free Wi-Fi and garden or sea views. Average score from 105 guest reviews: 8.4/10. The hotel is relatively new for the area it is in. Overall very good expedience. Staff was great! We loved the set up of the rooms and the breakfast that was included was really tasty and was available until 11am. There were coffee beans and a grinder right in the room. Location was perfect. I would definitely return to Hotel Palma Royale. We had a little outdoor patio and our room was clean and very beautiful. The staff were super friendly and helped us plan our short visit there. The staff was superb. I was really pleasantly surprised at how nice this facility was. The room was beautiful and very clean. Don't expect it to be the Ritz Carlton but it is very nice and for Bocas Town it is a great. It is very comfortable with spacious rooms with a very good location and friendly staff. We only stayed here one night but it was a great place. The room was modern, nicely equipped with comfy bed, air conditioning, chairs and table, wi-fi, a small outdoor patio, and a good free breakfast the next morning. It's conveniently located near the water taxi docks. Very comfortable rooms and excellent locations. People are very friendly. We liked the location next to the ocean. We could see the huge ferry come and go each day. There were several good restaurants within walking distance. The room had comfortable furniture and in-room coffee. There was a small balcony facing the water. The breakfast was quite good and included in the price. It included fresh tropical fruit and hot choices, like pancakes and french toast. It was not a buffet, which was a pleasant surprise. Also, the breakfast area was a covered, outside room where you could watch the foot traffic and the water. Excellent hotel staff....very helpful with tour arrangements! Offering an outdoor pool and a restaurant, Playa Bluff Lodge is located in La Gruta, Bocas Town. Free WiFi access is available in this beachfront lodge. Views of the garden and the ocean can be seen from the rooms at Playa Bluff Lodge. Average score from 84 guest reviews: 8.2/10. Stefanie and Martin and Roberto are awesome! They take care of your wellbeing, comfort and entertaining. Stefanie took care of our health, Martin cared about our housing and Roberto explained the jungle to us like no one else could have done better! Amazing location, great breakfast. Especially enjoyed our garden view rooms where I could practice my yoga in peace each morning. The Manager of the hotel is brilliant and can't thank her enough for her help. Location was both te best part and the drawback - it is wonderful to have the most beautiful beach on the island on your doorstep, but it is also far from the town and you have to take taxi. Staff was very nice, profesional and helpful. They make absolutely great Ceviche - definitely have to try if you stay there. Room was nice, not to hot and spacious. Overall it was a very good choce and we truly enjoyed staying there. Thank you for a lovely stay! Playa Bluff Lodge has a perfect location, just in front of Bluff beach, the best beach for surf in Isla Colón. The rooms are excellent. Great place. Great staff. Best cocktails in town. Peacefull location, really helpfull staff (we had a request for Booking and they really helped us out) beds, big bathroom, pool (rare in bocas del toro), jungle tour, breakfast, food at restaurant, organized bbq's, elegagor in the back garden!! A lot of birds, monkeys and sloths etc, beautiful beach! The women in charge of the place was a real sweethart that hellre us with everything, Always with a smile! Stunning view with a beautiful beach. The hotel manager, Michael, is extremeley friendly and helpful. The rooms are spacious and set in the tropical gardens, just steps away from a perfect beach. Kid-friendly pool to keep them busy, as they're not allowed to swim in the sea. The food was fine, decent breakfast. Next door restaurant was also amazing, if you're there for a few days and want a change. On the spot activities include a hike in the jungle (bring long trousers - boots available at the hotel) - which lasts 2 hours. Sfuff is very kind and relayable; Michael expecially is very friendly and he always pays attention and help us whatever we need...we have been here for 2 days and the place is amazing. Great breakfast! Thx! Offering a sun terrace and views of the sea, Casa Acuario is located in Carenero, 700 metres from Bocas Town. Every room is equipped with a TV. Some units have a seating area for your convenience. A terrace or balcony are featured in certain rooms. Average score from 28 guest reviews: 8.1/10. Amazing location with a beautiful view on Isla Colon and the sea. Lots of colourfull fish swimming around, hummingbirds join you for breakfast and pelicans sit around the hotel. Room was spacious, aircon did it's work, and good bathroom. Private deck chairs & hammock let you relax in style, in front of your own room. Hotel is far enough from Bocas town to get some good sleep (not too much noise etc), and is very easy to get to by watertaxi. You're in Bocas in minutes and taxis pass by often during the day. We only saw 2 or 3 mosquitos, and hardly any sandflies, on Isla Caranero. The location was much quieter than Bocas Town, and we saw some cool fish and pretty starfish right off the dock. We liked the homey Caribbean decor. The breakfast in the morning was a great deal. The room was very spacious for two people. We each had our own queen sized bed. The bed wasn't super comfortable but it sufficed. The location was great if you want to be close to Bocas Town but not in a very noisy area. Loved the fact that it had air conditioning! Little cozy hotel with 4 rooms only, we had the luck to be at firts level just above the beautiful Caribbean sea, great feeling of living inside the water. The room was big and welcoming, basic but perfect for the place we were visiting. Edgard, the person in charge of the guest, is very nice and helpful. He would cook you a delicious breakfast in the morning, help you with catching a boat to the main island and offer coffee and a nice chat along the day. Geräumige, sehr komfortable Zimmer, sehr nette Mitarbeiter (Edgar), sehr schöne Terasse/Balkon mit Blick aufs Meer und Bocas Stadt, trotzdem ruhig. 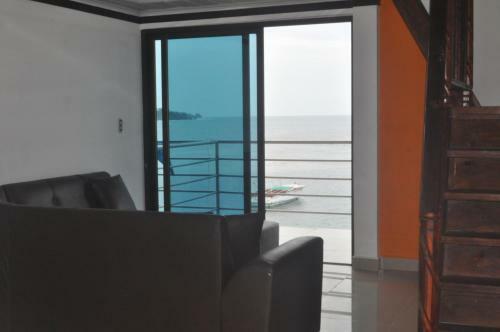 Offering a terrace and views of the sea, Bocas Town Apartments is situated in Bocas Town. Buena Vista is 23 km from the property. Free WiFi is provided throughout the property. The accommodation is air conditioned and is fitted with a TV. Average score from 13 guest reviews: 8.0/10. 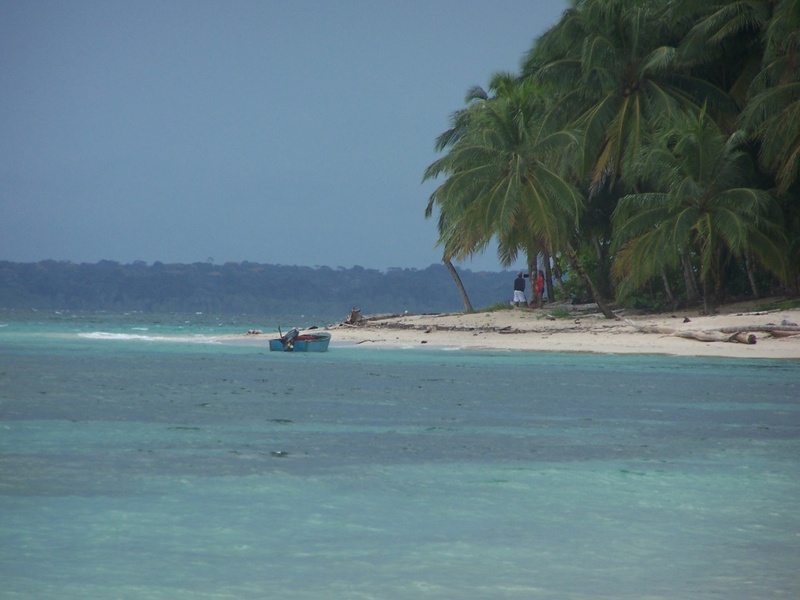 Bocas del Toro has great beaches surrounding its islands. These range from the classic calm tropical white-sand type for relaxing to those with good-sized surfing waves. Bocas del Toro is not yet well known as dive destination. However, it offers a great diversity of aquatic life around its islands, with calm conditions and highly competitive pricing among the diving operators. Snorkling options include Red Frog Beach and Wizard Beach on the island of Bastamentos.